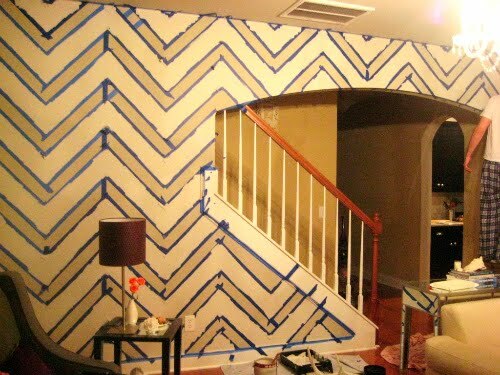 I've seen quite a few people painting chevron patterns on their walls....& yes, I like it! Maria from Layers of Meaning & her husband have done just that by taking on this DIY project. Personally, I think it creates an interesting impact to her living room...and perhaps in my next home, I will think of trying something similar. This is a great option for those of you who are SCARED to death of wallpaper!! I know this process of painting stripes, chevrons etc. may take a awhile, but from Maria's results I think it's well worth it! You can ALWAYS paint over it if you don't like it right?? And for all you MARRIED ladies....ask your husbands for a helping hand. You can see all the pics & read more about it on her blog. now thay is a labor of love! wonderfuuullllll post!why don t you write about glass roofs?I would love to read a post from u with this topic! It takes me to the 70's. I am sure it works in some rooms, not a whole room. The wall looks great! Very chic! That looks like a lot of work but so worth it ! It looks gorgeous! You've inspired me to do that in my living room too. Great job! I LOVE IT! It looks amazing. My first thought was that it was wallpaper. Love the neutral color with bold design. 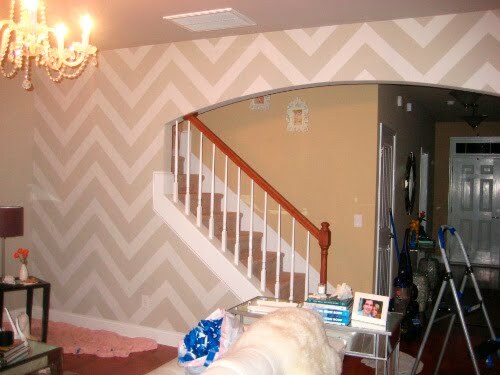 I'm in love with chevron...what a fantastic idea! That's one intimidating DIY, but it looks fantastic! what a fantastic idea. thanks for sharing! This took a lot of patience. More than I'll ever have but it came out beautiful. Oh my goodness I love it. I'm so afraid of taping straight lines! Wow, that seems like a lot of work but it looks amazing! That looks great, and makes such a statement! Looks like hard work but it's BEAUTIFUL! It is like the DIY Imperial Trelis over at the Hello Gorgeous Blog. It looked sooo tedious but the results were fab! I wish I had the patience for something like that hehe. There are different tools you can use... tape works, but I found that freezer paper worked best on fabric for my rug. Jen! Thank you for the post! Everyone - thank you for the lovely comments! It was indeed labor intensive but so worth it. We love it! She did a great job! Kudos to both her and her hubby! 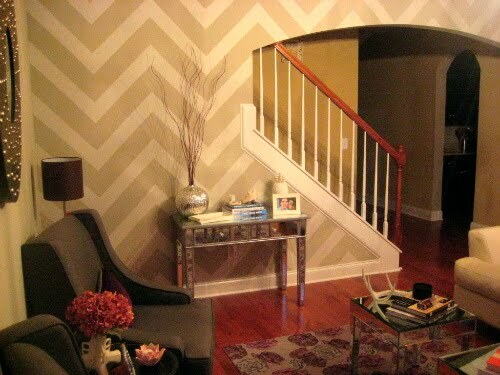 My husband and I are dying to do this chevron look in our hallway - we got a professional quote and it was $1500! I sent him this post to inspire him that we can do this as a DIY project! Love it! Hard work at its best. I like super-bright for where I work! Coisas Da Doris & Alice in Wonderland..